The Mughal emperors were dedicated collectors and connoisseurs of precious stones. They set them into jewellery and ornaments, or kept them unmounted in collections so large that they required a dedicated treasurer and assistants to manage their upkeep. Foreign travellers marvelled at the riches they encountered, the scale of which lead the English diplomat Sir Thomas Roe to describe the Mughal court of Jahangir as the ‘treasury of the world’. 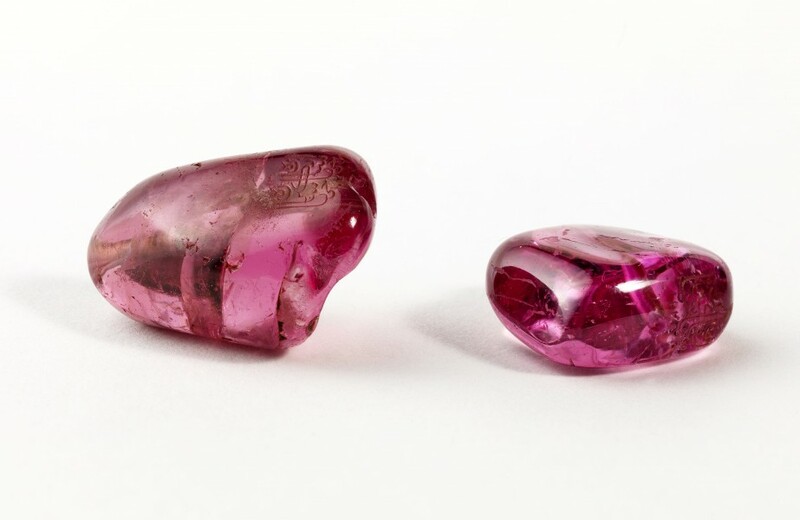 These spinel beads would have formed part of a necklace and are comparable to a collection of inscribed royal spinels in the al-Sabah Collection of Kuwait. Inheriting the practice from their Timurid and Mongol ancestors, the Mughals inscribed their stones with titles, dates and details of their lineage. On both spinels we find the typical calligraphic inscription of the name of the Emperor Shah Jahan (r.1628-1658), translated as ’Shah Jahan, son of Jahangir Shah’. Of all the Emperors, Shah Jahan was particularly known for his passion for gems. This inscription would ultimately be superseded by the title Sahib-i Qiran-i Sani (Second Lord of the Auspicious Conjunction), written in nasta’liq. The earliest extant example of an inscribed Mughal spinel dates from the reign of the Timurid prince Ulugh Beg (d.1449). A stone of such beauty and renown as to be fabled in literature throughout the centuries, it is unique in possessing the name of a Safavid ruler, Shah Abbas I (d. 1617), in addition to three Mughal Emperors: Jahangir (dated 1621), Shah Jahan (undated) and Aurangzeb (dated 1659-60 AD). The final inscription is the name of the Afghan ruler Ahmad Shah (dated 1754-55). The spinels pictured here demonstrate a characteristically Mughal delight in beauty and fine craftsmanship. They also illustrate the importance of lineage in Mughal political culture. Their significance, however, goes beyond wealth, beauty and power. Spinels occupied a special position in Iranian culture that was upheld in the Persianate courts of India. In poetry they were compared to blood and wine for their colour, and to the sun for their radiance. They were seen as symbols of light, both temporal and divine. Manuel Keene. Treasury of the World: Jewelled Arts of India in the Age of the Mughals (London: Thames & Hudson, 2002). Assadullah Souren Melikian-Chirvani, ‘The Red Stones of Light in Iranian Culture’, Bulletin of the Asia Institute, New Series/Volume 15 (2001) pp. 77-110. Susan Stronge. A Golden Treasury: Jewellery from the Indian Subcontinent (London: Victoria and Albert Museum, 1988).